Tibor Hollo’s 83-story Panorama Tower has been approved to be built at a taller height than originally planned. In March, the developer requested FAA permission to build at 868 feet above ground, or 876 feet above sea level. The agency granted approval late last month. Construction at Panorama started in October, 2014, with an approved height of 822 feet above ground. Even at that height, it was set to become the tallest building in Miami. Hollo’s Florida East Coast Realty told the FAA that they needed the additional height for elevator overruns and mechanical equipment. 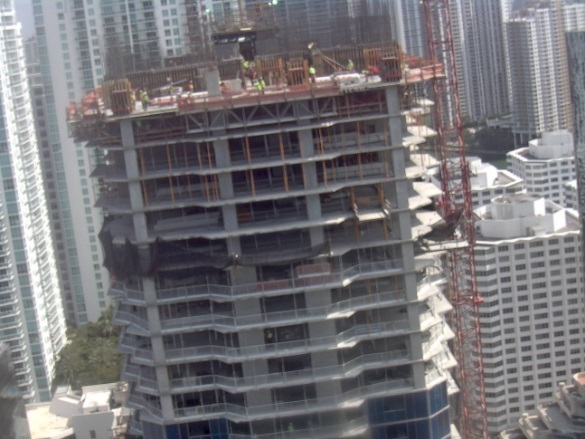 I really hope they go for another 32′ to reach the 900..
Hideous…just who are all the trolls on this site gushing over every tower regardless of design..by all means I’d love to see Miami’s skyline as big as New York or Chicago, but not if it’s all ugly and filler buildings. Agree with you 100%… I used to live at The Club and OMG…. When I first dared to say it was not just simplistic and unimaginative but also ugly, I got a bunch of thumbs down. Nice to see so many of you have finally come around.